Here are the instructions for the banner. The instructions for the cat are in the previous post. Each of my banner background pieces is 11” tall. To make the pattern I took an 8 1/2 X 11 piece of card stock and folded it in half vertically. Then I drew lines from the center of the bottom to the upper left and right corners. This makes the larger of the banner triangles. To make the smaller triangle, I repeated these steps above, and then trimmed it down. Mine measures approximately 6” wide across the top by 7.5 inches tall. 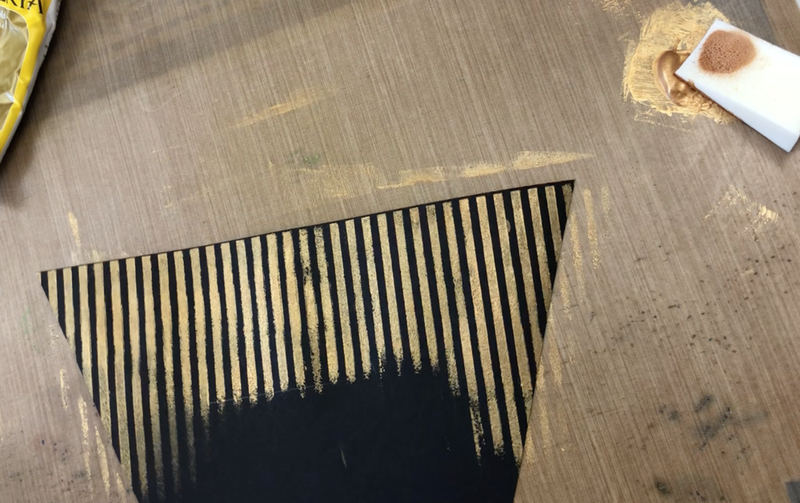 I cut the large triangle out of black card stock and used a striped stencil (I’m sorry I have no idea what brand) and my Windsor and Newton Gold Acrylic Paint to sponge paint stripes. You only need to go down part way because the smaller triangle is going to cover it up and I personally like the solid black edges on the lower half anyway. While that was drying, I worked on the trim. I cut 22” strips of orange and black crepe paper and cut off approximately 1/2”off of the orange piece. Then I layered them together with some striped organza ribbon I purchased at Floral Supply Syndicate in Upland, CA a few years ago. I hope they still have it cause I need more! 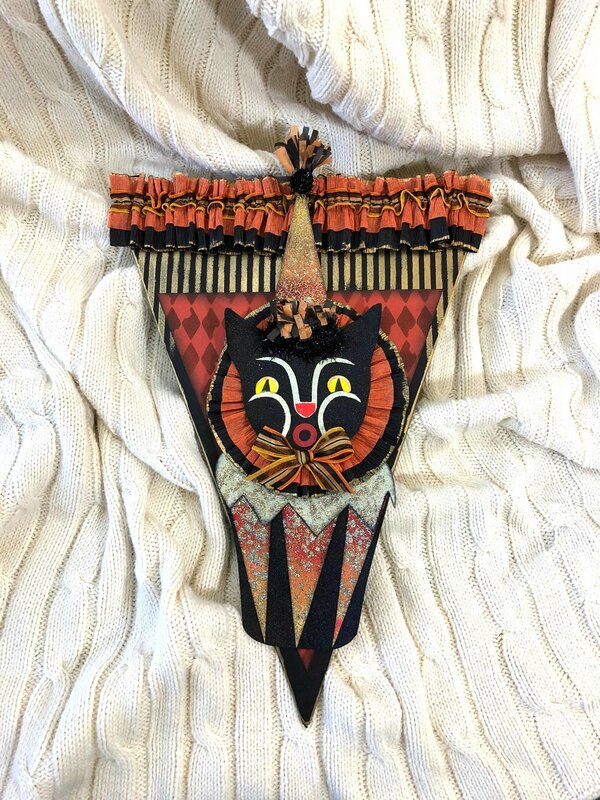 So, with my cat’s supervision, I ran a gathering stitch down the strip and gathered it into a ruffle. 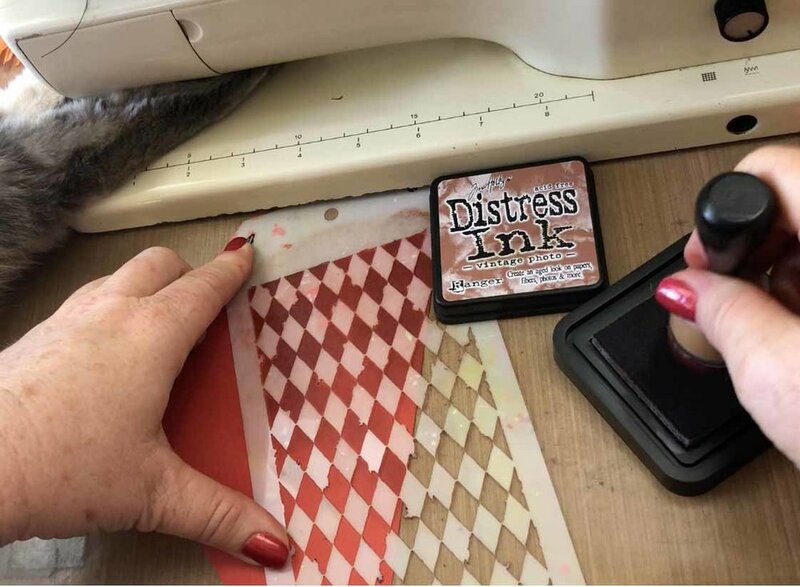 Next, I cut the smaller triangle out of rust card stock and inked it up with Vintage Photo Distress Ink and Tim Holtz Harlequin layering stencil. I love finishing up the edges of things so I inked them with Black Soot Distress Ink. 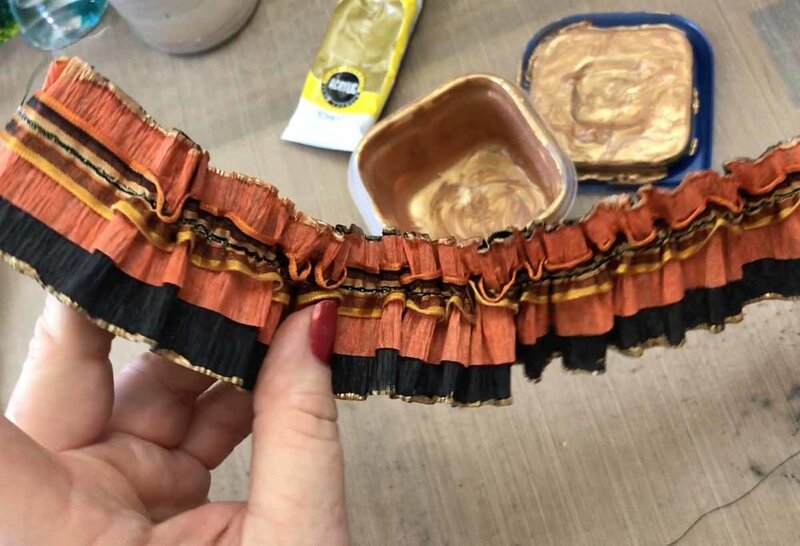 I watered down my Windsor and Newton Gold Acrylic paint a bit and added gold to the top and bottom edges of the ruffle. I just love how this came together! It gave me so many ideas for later that I can’t wait to try! Now we’re ready to start attaching these pieces. I hot glued the ruffle to the left and right top corner of the black triangle, adjusted my gathers, and then glued the middle. Then I attached the rust triangle. 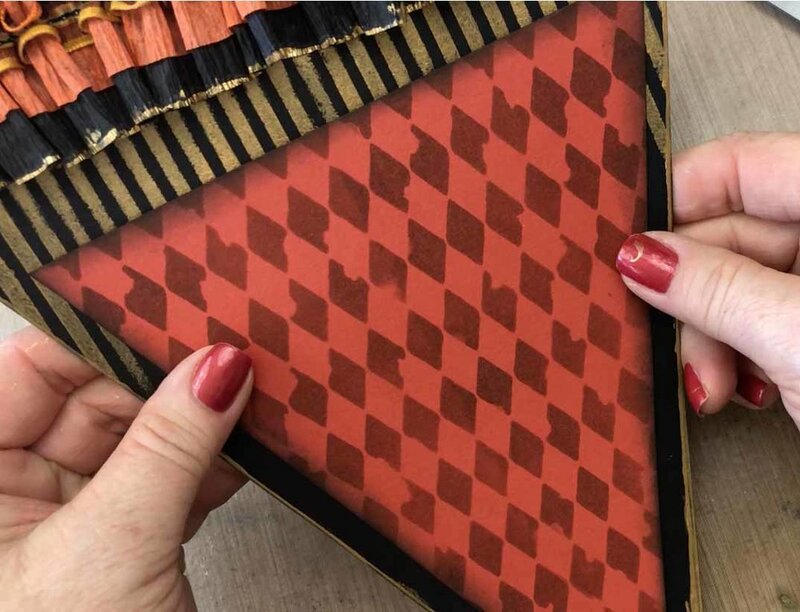 My card stock is not very heavy so I used some lightweight chipboard to cut out another large triangle - the same pattern I used for the black background triangle. I used my Dylusions paint to cover the back and side edges and glued it to the back of the decorated triangle. And voila! Because I’m making a series of these characters that be used for a banner, I also reversed the colors and patterns so I can alternate the pieces when assembling the banner. And that’s it! Thanks for creating with me! You can purchase these .svg cutting file patterns here! For instructions to make the characters, please refer to my blog posts.